Sandringham School. A student and parent guide to Key Stage 3 assessment and reporting from September 2016. Download "Sandringham School. A student and parent guide to Key Stage 3 assessment and reporting from September 2016." 1 Sandringham School A student and parent guide to Key Stage 3 assessment and reporting from September 2016. 2 1. How is assessment at Key Stage 3 changing from September 2016? In September 2014, the government announced that National Curriculum Levels were to be abolished and not replaced. Instead, from September 2016, all secondary schools in England and Wales are required to publish their own assessment policies, detailing how progress and attainment across Key Stages 3-4 will be assessed and reported. This guide explains how Sandringham School plans to assess and report student achievement from September 2016 across s 7-11, with a particular focus on the changes at Key Stage Why have National Curriculum Levels been abolished? Levels were first introduced alongside the National Curriculum in For almost 30 years, they have provided schools, students and parents or carers with a universal language around assessment across Key Stages 1-3, as well as a common criteria against which achievement in individual subjects could be benchmarked, tracked and monitored. Until this year, Levels were also used to report the results of Key Stage 1 and 2 statutory assessments (SATS) in s 2 and 6. Following the abolition of Levels, for the first time this summer, SATS results will not be reported in the form of Levels but rather as a scaled score in the range of At KS2, the government s expectation is that 85% of all students meet the new secondary ready score of 100 (roughly equivalent to a Level 4b at present). The government s decision to remove Levels from the National Curriculum was motivated by a number of different factors. The main reasons were: a) Accuracy and consistency Levels were originally intended to be used as broad end-of-unit, end-of-year descriptors, providing students and parents with a best-fit summary of how well learners had mastered the knowledge and skills associated with individual subjects. In practise however, the increasingly widespread use of Levels to assess individual tasks and assignments, distorted this purpose. b) Clarity and coherence The introduction of sub-levels (e.g. 4a, 4b, 4c), whilst enabling schools to demonstrate progress at shorter, more regular intervals, has further undermined the usefulness of Levels. Government research suggested that many students and parents or carers did not fully understand and could not clearly explain the difference between specific Levels or sub- Levels in relation to different subjects. c) Fixed v. growth mindset Where Levels were the main focus of conversations with students and parents or carers, learners understandably often focused more on the Level or sub-level awarded, than on the specific guidance and feedback provided. Removing Levels therefore has the potential to accelerate learning and student progress by focusing feedback on those aspects of the curriculum where their knowledge and understanding is secure and those areas where there are gaps. Linked to this, evidence also suggests that removing Levels and the label associated with them, emphasises to learners that there is no ceiling on achievement and helps to promote a positive growth mind-set. 3 3. Assessment principles Sandringham s new assessment framework seeks to address these concerns and capitalise on the opportunity presented by the removal of Levels, to introduce an assessment system that: Is simple and easy to understand - for staff, students and parents Is based on high expectations and challenge for all Is closely linked to the curriculum and focused on developing the knowledge, understanding and skills needed for success at Key Stage 4 Improves learning and encourages a growth mindset by providing students and parents with high quality next-steps feedback focused on specific objectives Tracks pupil progress in relation to an aspirational target across Key Stages 3 and 4 Allows all students to experience success, by focusing on the progress they are make from their starting point Differentiates between pupils of different abilities, giving early recognition of pupils who are falling behind and those who are excelling 4. The mastery curriculum and student trackers From September 2016, the level ladder, which currently provides the basis for assessment and reporting at KS3, will be replaced by the mastery curriculum. Instead of using Levels or sub-levels to assess achievement and inform feedback, the core knowledge, concepts and skills that underpin each subject will be assigned to six broad thresholds. These thresholds correspond broadly to the old National Curriculum Levels 3-8, but have been updated to reflect recent changes both to KS2 and GCSE. In s 7-9, in most subjects, student achievement is assessed in relation to four of the six thresholds. The descriptors attached to each threshold emerging, developing, securing, mastering - provide students with a clear indication of how well they are progressing. Very simply, each student s target is to master the knowledge, concepts and skills delivered in each year of the programme of study. 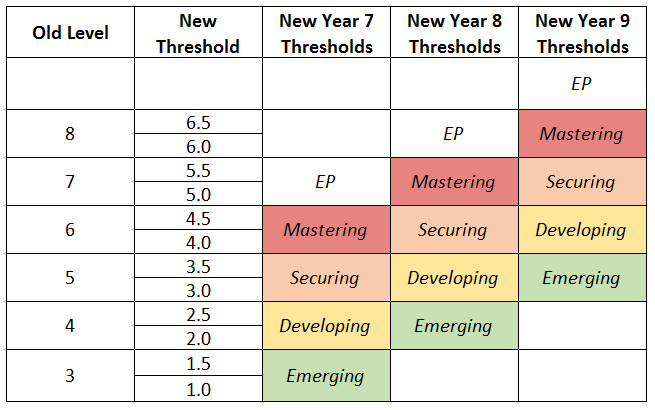 As the diagram above illustrates, the thresholds are progressive and build year-on-year throughout the programme of study. What, for example, constitutes securing in 7, would only count as developing in 8 and emerging in 9. At the top end, where students are demonstrating knowledge, understanding and skills above and beyond those specified in that year of the programme of study, they are deemed to making exceptional progress (EP). Examples of this might include problem-solving, applying the knowledge and skills they have gained to new and unfamiliar contexts, adapting their work for different audiences or conducting their own research and shaping their own lines of enquiry. 4 Student-friendly trackers, like the 7 Music and History exemplars that follow, provide learners with a clear breakdown of what each descriptor means, detailing precisely what knowledge, understanding and skills are required to attain each new threshold. For each subject, trackers for each year group (or set for those subjects that set students by ability), together with a progression map for the whole of Key Stage 3 and a curriculum map outlining course content are available to view on the faculty area of the school website. 5 7 History Tracker: Key concepts and skills To succeed in History at Sandringham there are a range of key concepts and key skills that you must master as your progress through Key Stage 3. Refer to this sheet often and use it to help you with your home learning and assessments: it is your guide to becoming a master historian! Key skills and concepts Emerging Developing Secure Mastering Cause and consequence Historians explain and analyse the causes and consequences of events. You can describe historical events through story or narrative. You make accurate statements but do not development them with examples. You can identify and describe the long-term and short-term causes of events. You make limited use of examples. Your descriptions lack development. You can identify and explain the long-term and short-term causes of events briefly. You include some basic examples and write in You can explain a range of different causes (for example short and long term) You include some detailed examples and write in clear PEA Change and continuity Historians explain and analyse change and continuity over time. You can identify examples of change between two different periods. You make accurate statements but do not development them with examples. You can describe examples of change between two periods or over time. You make limited use of examples. Your descriptions lack development. You can make simple explanations of change and continuity. You include some basic examples and write in You can make developed explanations of change and continuity. You include some detailed examples and write in clear PEA Significance Historians can make judgements about the relative important of events and individuals. You can identify important people, events, and developments. You make accurate statements but do not development them with examples. You can describe the importance of people and their actions, events, and developments. You make limited use of examples. Your descriptions lack development. You can explain how / why people and their actions, events, and developments are important. You include some basic examples and write in You can make developed explanations of how significant events, individuals, or developments led to change. You include some examples of significance (e.g. impact or legacy). Using historical evidence Historians use evidence to support their views and analyse sources for usefulness and reliability. You can use evidence to extract information to learn about the past. You mainly summarise the source or select quotations without inference. You can use evidence to make basic suggestions ( inferences ) about the past. You select quotations from the text to support your ideas. You do not yet consider the provenance. You can use the provenance to make developed inferences and basic judgements concerning usefulness and reliability. You include quotations / extracts and make accurate inferences. You make some limited use of the provenance. You can analyse the sources using elements of the provenance to judge usefulness and reliability. You include quotations / extracts and make accurate inferences. You make good use of the provenance. Understanding interpretations Historians understand that there are different interpretations of the past and explain why people have different views. You can identify what other people have said about the past. You mainly summarise the source or select quotations without inference. You can describe the opinion of an author or historian based on reading source material. You select quotations from the text to support your ideas. You do not yet consider the provenance. You can explain the differences in opinion between two or more different authors based on reading source material. You include quotations / extracts and make accurate inferences. You make some limited use of the provenance. You can explain the opinion (interpretation) of an author based on reading source material and considering the provenance. You include quotations / extracts and make accurate inferences. You make good use of the provenance. 7 reviewed at regular intervals throughout the year. Where a student is consistently working at the upper end of their Learning Journey KS4 target range or exceeding it, they will be moved up to the next Learning Journey. 6. How will student progress in relation to their Learning Journeys be reported? Student Learning Journeys provide a clear, consistent and measurable benchmark against which achievement in different subjects can be assessed and reported. In place of a Level or sub-level on student target stickers and reports, arrows will instead be used to indicate how well students are progressing towards their aspirational target. Making expected progress. On track to achieve aspirational target Making better than expected progress. On track to achieve or exceed aspirational target. Making less than expected progress. Not currently on track to achieve aspirational target. More effort needed. It is important to note that the upper end of Sandringham s aspirational KS4 target range, places students in the top 10% of outcomes for students nationally in terms of progress across Key Stages 2-4. As such, making expected progress towards these aspirational targets is a significant achievement in itself and something that students should be proud of. 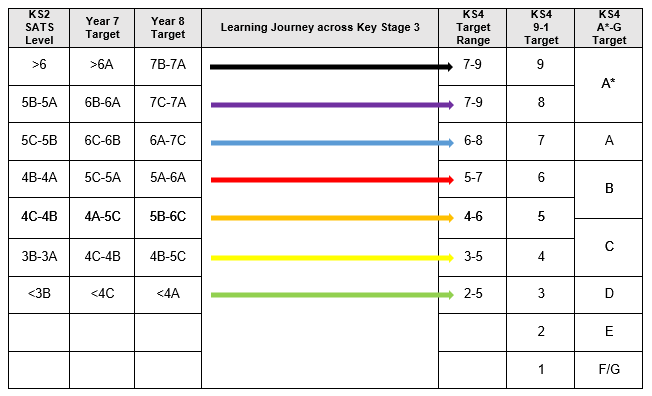 The sample target sticker above, taken from a 8 student s planner and populated with the first round of autumn achievement data, shows that Joe Bloggs has been placed on to the same 6-8 Learning Journey for 10 of his 13 subjects. With the exception of PRE, where is he working towards the bottom end of the target range, Joe is either making expected or better than expected progress towards his aspirational target in these 10 subjects. Joe is performing more highly in Maths and PE, and to reflect this he has been assigned to the higher 7-9 learning journey for these subjects. Art is his weakest subject in relative terms, although he is making expected progress towards the 5-7 target range. In English and Mathematics, Joe is making better than expected progress and working towards the top end of the target range. If he can sustain this high level of achievement, he may be moved up a Learning Journey in these subjects. 9 7. 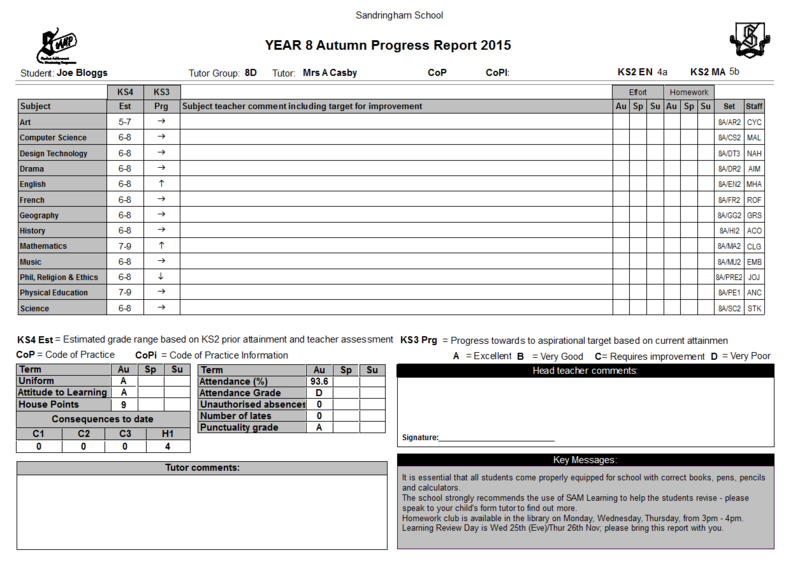 Reporting cycle Sandringham reports at regular intervals throughout the academic year and, each year, parents will receive three written reports. 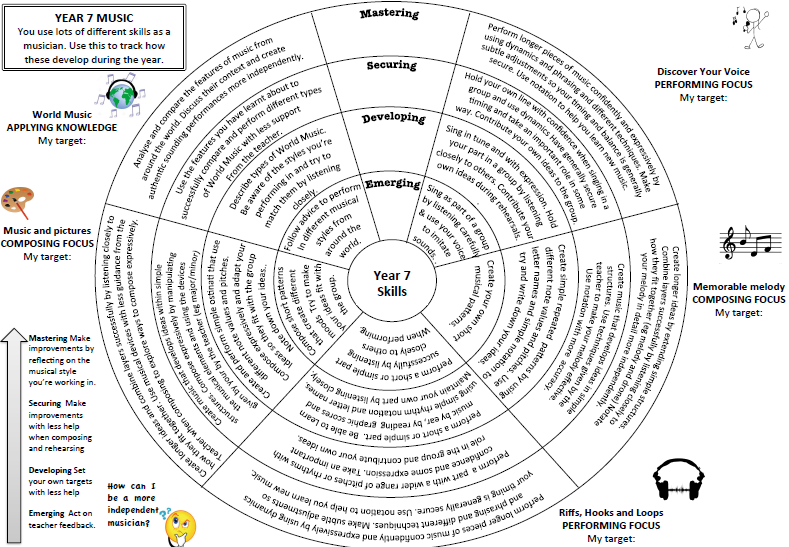 As the exemplar report on the previous page shows, for each subject, teachers will indicate how well the student is working in relation to their assigned Learning Journey - are they making expected, above expected or below expected progress towards their aspirational target grade. Alongside these descriptors, teachers will add a specific objective or comment, indicating what students must focus on in order to further develop their mastery of different aspects of the subject. The first report for each year group will be issued mid-november ahead of the Learning Review Day, which is held at the end of November. At the Learning Review Day, parents or carers meet with a member of staff, usually the form tutor, to discuss the academic progress of their son/daughter. The next report is issued in the spring term and is issued ahead of the Parent Teacher Consultation evening. The final report is issued in the summer term Autumn term report issued prior to Learning Review Day on 17 th November 2016 Learning Review Day Thursday 24 th November 2016 Spring term report issued mid-april PTC end of April Summer term report issued July Autumn term report issued prior to Learning Review Day on 17 th November 2016 Learning Review Day Thursday 24 th November 2016 Spring term report issued early-april PTC end of April Summer term report issued July Autumn term report issued prior to Learning Review Day on 17 th November 2016 Learning Review Day Thursday 24 th November 2016 Spring term report issued mid-feb PTC mid-april Summer term report issued July Autumn term report issued prior to Learning Review Day on 17 th November 2016 Learning Review Day Thursday 24 th November 2016 Spring term report issued mid-march PTC end of March Summer term report issued July Autumn term report issued prior to Learning Review Day 17th November 2016 Learning Review Day Thursday 24th November 2016 Exam results issued January PTC January 8. Feedback and comments If, after reading this guide, you have any questions about the forthcoming changes to KS3 assessment and reporting at Sandringham, please do not hesitate to contact the school. If you would like to hear more about the changes or speak to somebody in person, a KS3 Assessment Information Evening for parents or carers of students in s 7-8 has been scheduled for Monday 6 th June at pm in the Main School Hall. PRIMARY SCHOOLS ICT and Standards A report to the DfES on Becta s analysis of national data from OFSTED and QCA 1 This publication reports on Becta s analysis of national data on ICT and educational standards.